Pyrrhotite: Mineral information, data and localities. Also given as Fe1-x (x = 0 to 0.17). The various polytypes known have slightly different stoichiometries. Named in 1847 by Ours-Pierre-Armand Petit-Dufrénoy from Greek πνρρός "pyrrhos", flame-colored. Pyrrhotite is found with pentlandite in basic igneous rocks, veins, and metamorphic rocks. 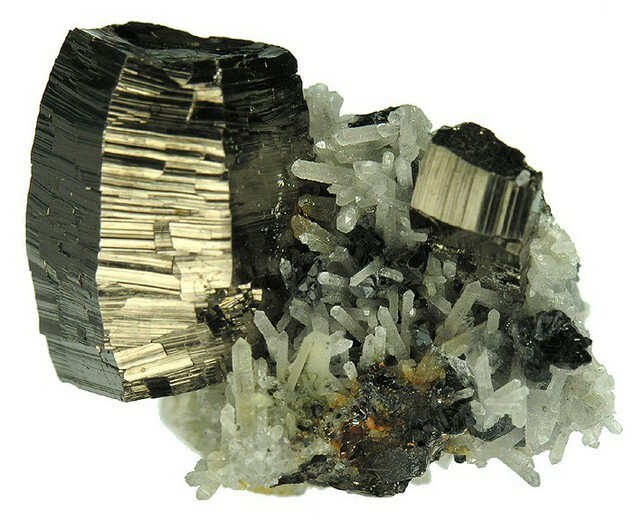 It is also often found with pyrite, marcasite, and magnetite. 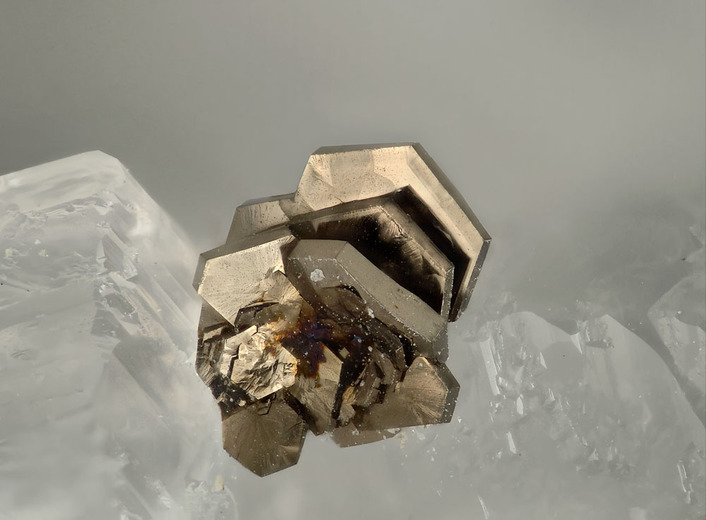 It has varying magnetic powers, depending on the number of Fe vacancies in the crystal structure. A related species with no vacancies (and therefore non-magnetic), is called troilite and has been found in meteorites and rarely terrestrially. Several polytypes are known; the most common one is pyrrhotite-4C. Visually similar to smythite and troilite. Compare 'UM1989-25-S:FeNi' - a representative of the Fe1-xS-Ni1-xS (Mss) solid solution. 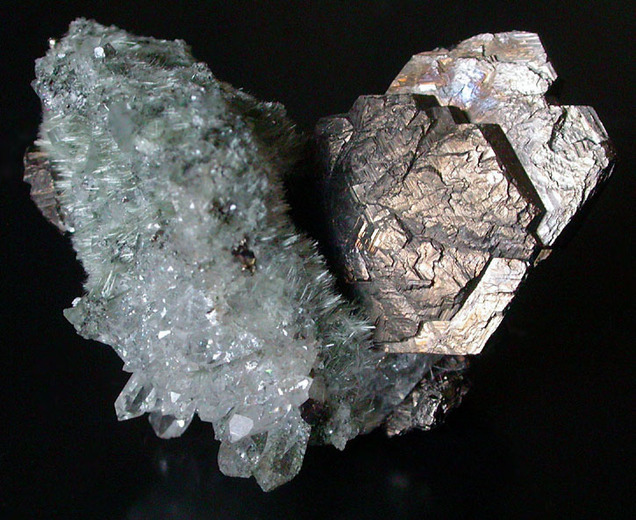 Usually, the pyrrhotite is on the galena, but codepositing intergrowths are known. The "six-fold" axis of pyrrhotite is parallel to the three-fold axis (octahedral axis) in galena. Cobaltoan Pyrrhotite A cobalt-bearing variety of pyrrhotite. Nickeloan Pyrrhotite A nickel-bearing variety of pyrrhotite. Note, however, that there are several iron-nickel sulphides. Quartz 391 photos of Pyrrhotite associated with Quartz on mindat.org. Calcite 307 photos of Pyrrhotite associated with Calcite on mindat.org. Sphalerite 284 photos of Pyrrhotite associated with Sphalerite on mindat.org. Siderite 253 photos of Pyrrhotite associated with Siderite on mindat.org. Pyrite 209 photos of Pyrrhotite associated with Pyrite on mindat.org. Galena 196 photos of Pyrrhotite associated with Galena on mindat.org. Dolomite 119 photos of Pyrrhotite associated with Dolomite on mindat.org. Chalcopyrite 119 photos of Pyrrhotite associated with Chalcopyrite on mindat.org. Marcasite 48 photos of Pyrrhotite associated with Marcasite on mindat.org. Arsenopyrite 48 photos of Pyrrhotite associated with Arsenopyrite on mindat.org. Palache, C., Berman, H., Frondel, C. (1944) The System of Mineralogy of James Dwight Dana and Edward Salisbury Dana Yale University 1837-1892, Volume I: Elements, Sulfides, Sulfosalts, Oxides. John Wiley and Sons, Inc., New York. 7th edition, revised and enlarged, 834pp. : 231-235. Kiskyras, D.A. (1950) The magnetic properties of pyrrhotite at various temperatures with special regard to its origin. Neues Jahrbuch für Mineralogie, Geologie und Paläontologie, Abhandlungen, Abteilung A: Mineralogie, Petrographie 80A, 297-342. Campbell, F.A. (1963) Sphalerite-pyrrhotite relationships at Quemont Mine. The Canadian Mineralogist: 7: 367-374. Carpenter, R.H., Desborough, G.A. (1964) Range in solid solution and structure of naturally occurring troilite and pyrrhotite. American Mineralogist: 49: 1350-1365. Arnold, R.G. (1967) Range in composition and structure of 82 natural terrestrial pyrrhotites. The Canadian Mineralogist: 9: 31-50. Fleet, M.E., MacRae, N. (1969) Two-phase hexagonal pyrrhotites. The Canadian Mineralogist: 9: 699-705. Graham, A.R. (1969) Quantitative determination of hexagonal and monoclinic pyrrhotites by X-ray diffraction. The Canadian Mineralogist: 10: 4-24. Clark, A. H. (1970) Quantitative determination of hexagonal and monoclinic pyrrhotites by X-ray diffraction: A discussion. The Canadian Mineralogist: 10: 278-280. Yund, R.A., Hall, H.T. (1970) Kinetics and mechanism of pyrite exsolution from pyrrhotite. Journal of Petrology: 11: 381-404. Fleet, M.E. (1971) The crystal structure of a pyrrhotite (Fe7S8). Acta Crystallographica: B27: 1864-1867. Tokonami, M., Nishiguchi, K., Morimoto, N. (1971) Crystal structure of a monoclinic pyrrhotite (Fe7S8). American Mineralogist: 57: 1066-1080. Batt, A.P. (1972) Nickel distribution in hexagonal and monoclinic pyrrhotite. The Canadian Mineralogist: 11: 892-897. Carpenter, H.R., Bailey, A.C. (1973) Application of Ro and Ar measurements to the study of pyrrhotite and troilite. American Mineralogist: 58: 440-443. Vaughan, D.J. (1973) Variation in properties of synthetic "pyrrhotites" of composition Fe (sub 1-x) S (O< or =x< or =0.14). The Canadian Mineralogist: 11: 1008-1011. Ramsden, A.R. (1975) Compositions of coexisting pyrrhotites, pentlandites and pyrites at Spargoville, Western Australia. The Canadian Mineralogist: 13: 133-137. Morimoto, N., Gyobu, A., Mukaiyama, H., Izawa, E. (1975) Crystallography and stability of pyrrhotites. Economic Geology: 70: 824-833. Corlett, M. (1977) Iron oxides and pyrrhotites from Igdlukunguaq, Disko Island, Greenland. The Canadian Mineralogist: 15: 540-545. Fleet, M.E. (1978) The pyrrhotite-marcasite transformation. The Canadian Mineralogist: 16: 31-35. Kuebler, L. (1981) Note on the hardness of hexagonal pyrrhotite and a method for measuring the abrasion depth in sulfides. The Canadian Mineralogist: 19: 355-359. Campbell, F.A., Ethier, V.G. (1984) Nickel and cobalt in pyrrhotite and pyrite from the Faro and Sullivan orebodies. The Canadian Mineralogist: 22: 503-506. Pasquariello, D. M., Kershaw, R., Passaretti, J. D., Dwight, K., Wold, A. (1984) Low-temperature synthesis and properties of Co9S8, Ni3S2, and Fe7S8. Inorganic Chemistry: 23: 872-874. Keller-Besrest, F., Collin, G. (1990) Structural aspects of the α transition in stoichiometric FeS: identification of the high-temperature phase. Journal of Solid State Chemistry: 84: 194-210. Barkov, A.Y., Laajoki, K.V.O., Men'shikov, Y.P., Alapieti, T.T., Sivonen, S.J. (1997) First terrestrial occurrence of titanium-rich pyrrhotite, marcasite and pyrite in a fenitized xenolith from the Khibina alkaline complex, Russia. The Canadian Mineralogist: 35: 875-885. Nesbitt, H.W., Schaufuss, A.G., Scaini, M., Bancroft, G.M., Szargan, R. (2001) XPS measurement of fivefold and sixfold coordinated sulfur in pyrrhotites and evidence for millerite and pyrrhotite surface species. American Mineralogist: 86: 318-326. Farrell, S.P., Fleet, M.E. (2002) Phase separation in (Fe,Co)1-xS monosulfide solid-solution below 450°C, with consequences for coexisting pyrrhotite and pentlandite in magmatic sulfide deposits. The Canadian Mineralogist: 40: 33-46. Froese, E. (2003) Point defects in pyrrhotite. The Canadian Mineralogist: 41: 1061-1067. Selivanov, E.N., Vershinin, A.D., Gulyaeva, R.I. (2003) Thermal expansion of troilite and pyrrhotine [sic] in helium and air. Inorganic Materials: 39: 1097-1102. Powell, A.V., Vaqueiro, P., Knight, K.S., Chapon, L.C., Sanchez, R.D. (2004) Structure and magnetism in synthetic pyrrhotite Fe7S8: a powder neutron-diffraction study. Phys. Rev., Serie 3.B - Condensed Matter: 70: 014415-1 - 014415-12. Wang, H., Salveson, I. (2005) A review on the mineral chemistry of the non-stoichiometric iron sulphide, Fe1-xS (0≤x≤0.125): polymorphs, phase relations and transitions, electronic and magnetic structures. Phase Transitions: 78: 547-567. Makovicky, E. (2006) Crystal structures of sulfides and other chalcogenides. Reviews in Mineralogy and Geochemistry: 61: 7-125.
de Villiers, J.P.R., Liles, D.C. (2010) The crystal-structure and vacancy distribution in 6C pyrrhotite. American Mineralogist: 95: 148-152. Elliot, A.D. (2010): Structure of pyrrhotite 5C (Fe9S10). Acta Crystallographica B66, 271-279. Becker, M., de Villiers, J., Bradshaw, D. (2010) The mineralogy and crystallography of pyrrhotite from selected nickel and PGE ore deposits. Economic Geology: 105: 1025-1037. Harries, D., Pollok, K., Langenhorst, F. (2011) Translation interface modulation in NC-pyrrhotites: Direct imaging by TEM and a model toward understanding partially disordered structural states. American Mineralogist: 96: 716-731. Liles, D.C., de Villiers, J.P.R. (2012) Redetermination of the structure of 5C pyrrhotite at low temperature and at room temperature. American Mineralogist: 97: 257-261. Ssu Han Li, Yen-Hua Chen, Jey-Jau Lee, Hwo-Shuenn Sheu (2018): Phase transition of iron sulphide minerals under hydrothermal conditions and magnetic investigations. Physics and Chemistry of Minerals 45, 27-38. The following Pyrrhotite specimens are currently listed for sale on minfind.com.